An intensely warm winter and spring are melting climate records across Alaska, reports NOAA in the post 'Arctic set for record-breaking melt'. 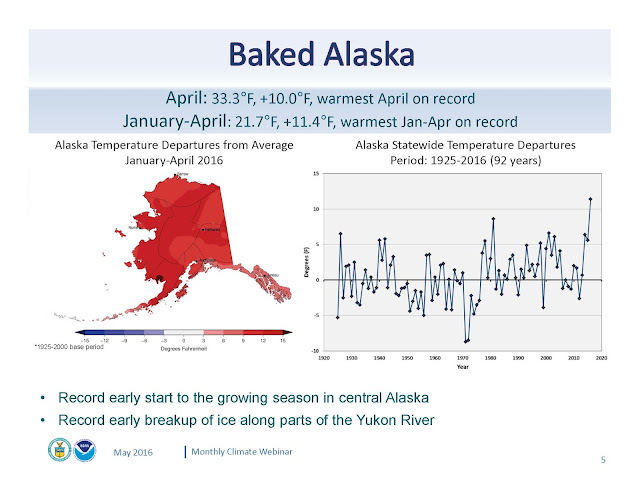 The January-April 2016 period was 11.4°F (6.4°C) warmer than the 20th century average, reports NOAA. The NOAA image below further illustrates the situation. 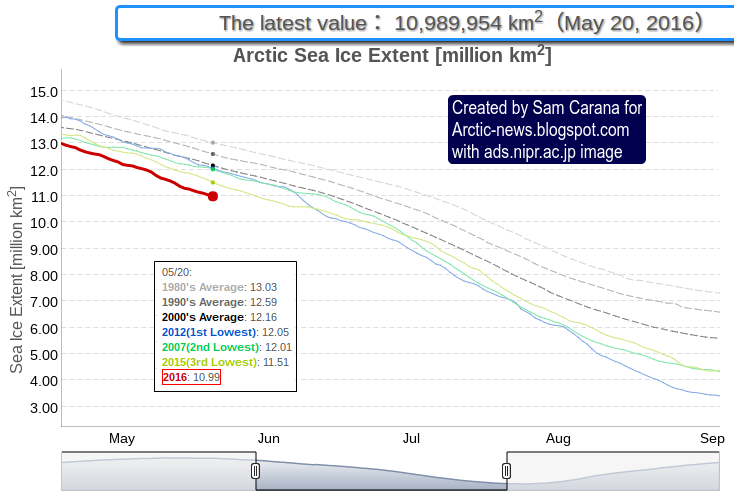 The sea ice is melting rapidly. 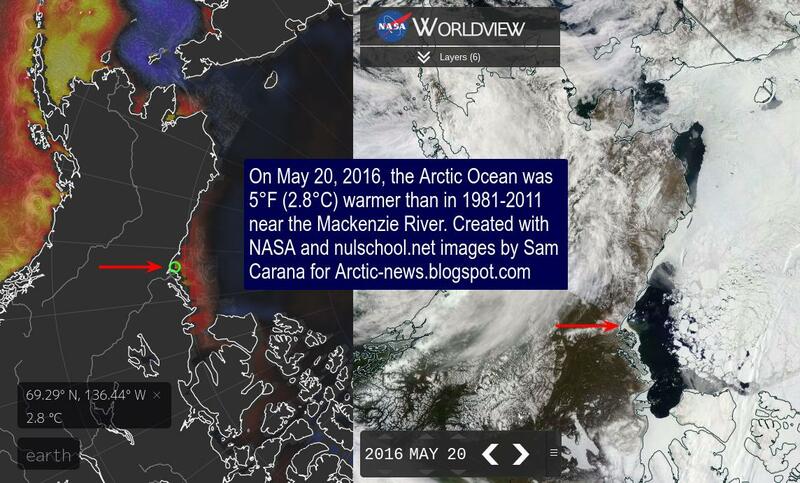 Warm water from the Mackenzie River contributes to dramatic melting in the Beaufort Sea, as illustrated by the image below, showing that on May 20, 2016, the Arctic Ocean was 5°F (2.8°C) warmer than in 1981-2011 at the delta of the Mackenzie River. The image below shows that on May 20, 2016, sea ice extent was 10.99 million square km, compared to the 12.05 million square km extent of the sea ice in May 20, 2012, as measured by JAXA. 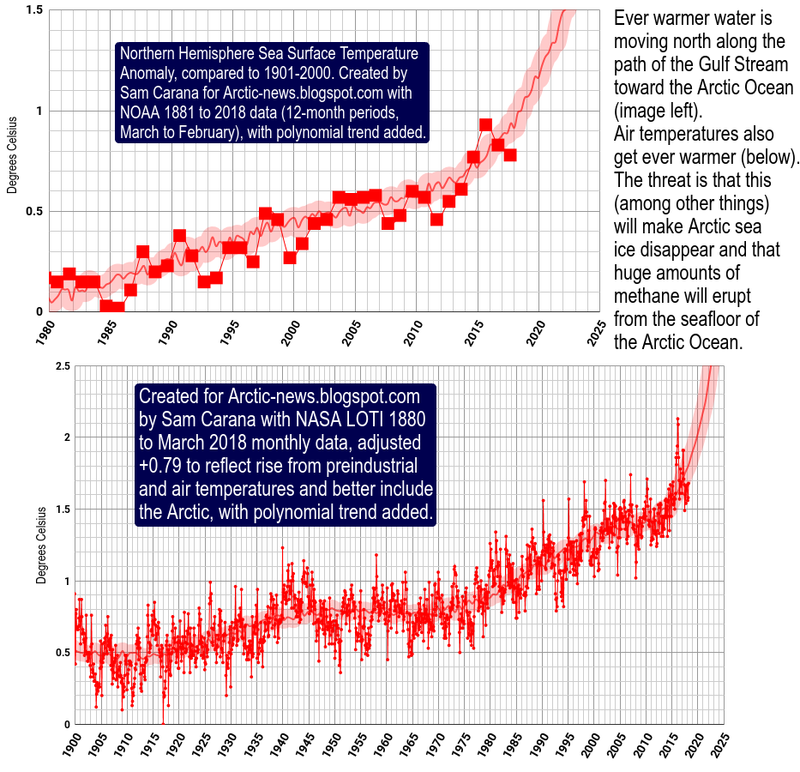 Sea ice reached a record minimum extent of 3.18 million square km on September 15, 2012, and chances are that the sea ice will be largely gone by September 2016. The year 2016 is an El Niño year and insolation during the coming months of June and July is higher in the Arctic than anywhere else on Earth. Higher temperatures come with increased danger of wildfires. Greenhouse gases are at record high levels: in April and may, CO2 was about 408 ppm, with hourly peaks as high as 411 ppm (on May 11, 2016). 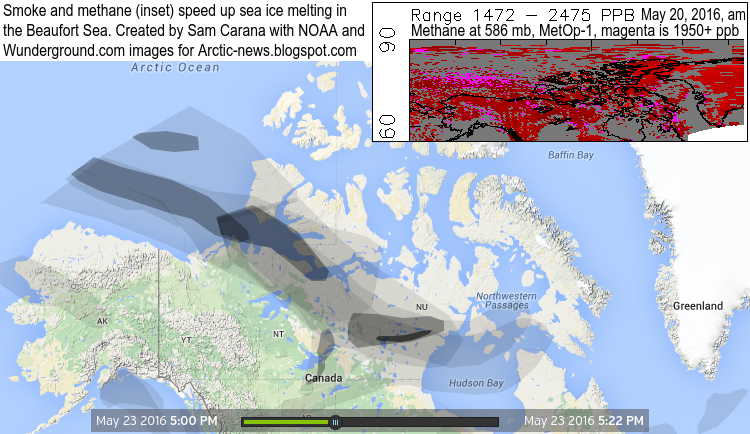 Methane levels are high and rising, especially over the Arctic. Smoke and methane are speeding up sea ice melting, as illustrated by the image below showing smoke from wildfires in Canada extending over the Beaufort Sea (main image), in addition to high methane levels that are present over the Beaufort Sea (inset). Ocean heat is also very high and rising. Oceans on the Northern Hemisphere were 0.93°C (or 1.7°F) warmer in the most recent 12-months period (May 2015 through April 2016) than the 20th century average. The image below shows sea ice extent as measured by the NSIDC, confirming that melting of the sea ice in 2016 is way ahead on previous years. Here's an animation comparing sea surface temperatures of the North Atlantic between May 25, 2015, and May 25, 2016. 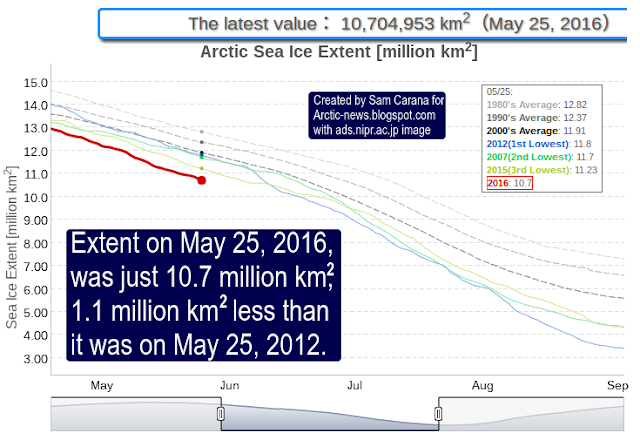 Arctic sea ice extent was 10.7 million km2 on May 25, 2016, 1.1 million km2 less than it was on May 25, 2012, as the update below shows. Chances are that Arctic sea ice will be largely gone by September 2016. As the ice declines, ever more sunlight gets absorbed by the Arctic Ocean. This is one out of numerous feedbacks that are hitting the Arctic. 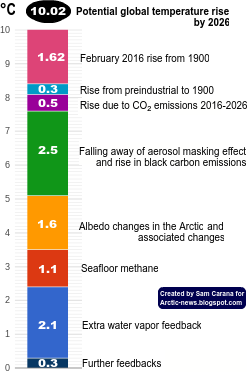 The danger is that, as these feedbacks start to kick in more, heat will reach the seafloor of the Arctic Ocean and trigger methane to be released in huge quantities from the Arctic Ocean seabed. Recently, an abrupt methane release from the Arctic Ocean seafloor did enter the atmosphere over the East Siberian Sea, showing up with levels as high as 2578 ppb (at 586 mb on May 15, 2016, pm, see image below). Such abrupt releases are indications that methane hydrates are destabilizing and are warnings that climate catastrophe is waiting to happen. 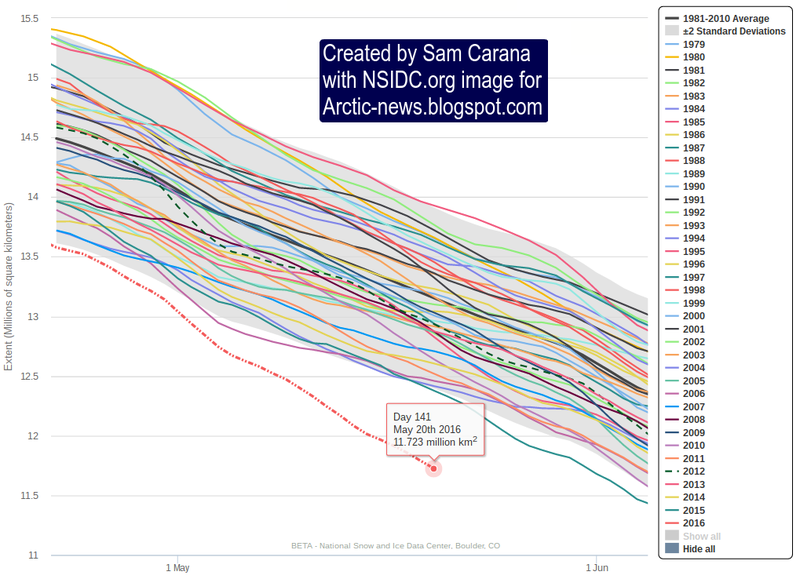 From the post Further Confirmation Of Arctic Sea Ice Dramatic Fall. The situation is dire and calls for comprehensive and effective action as described in The Climate Plan will be ignored by the Washington Power Brokers and the public more generally. Given that the political and industrial leaderships have been briefed on these forthcoming realities, one may conclude that they have other plans in mind. That things will get much worse is already locked in . . .